When her rescue dog wouldn’t stop obsessing over a spot on her face, she decided to get it checked out by a doctor. When she found out it was cancer, she realized that her dog saved her life. Two years ago, Lauren Gauthier saved a hound pup’s life by rescuing her from an animal shelter filled with hunting dogs abandoned by their owners. Imagine her surprise when, months later, Victoria the hound returned the favor, putting her keen nose to use and sniffing out skin cancer that Lauren had assumed was a pimple or a clogged pore on her right nostril. “Whenever I’d sit down on the couch, she’d cuddle next to me and start sniffing that little spot on my nose, then she’d sit and stare at me,” says Lauren, 42, an attorney from East Amherst, New York. Lauren was shocked when a biopsy last summer revealed that she had basal cell carcinoma, a skin cancer that accounts for about 32 percent of all cancers globally. She believes that regularly using tanning beds as a teenager could be the reason she developed skin cancer. Unchecked, that irritating little bump on her nose could have spread through all of her nasal tissue and then other portions of her face, requiring invasive surgery and causing disfigurement, even death. “I’m so grateful to Victoria — as you can imagine, she’s received lot of treats and hugs,” says Lauren, who was left with minor scarring after the cancer was removed, but is relieved that it wasn’t worse. 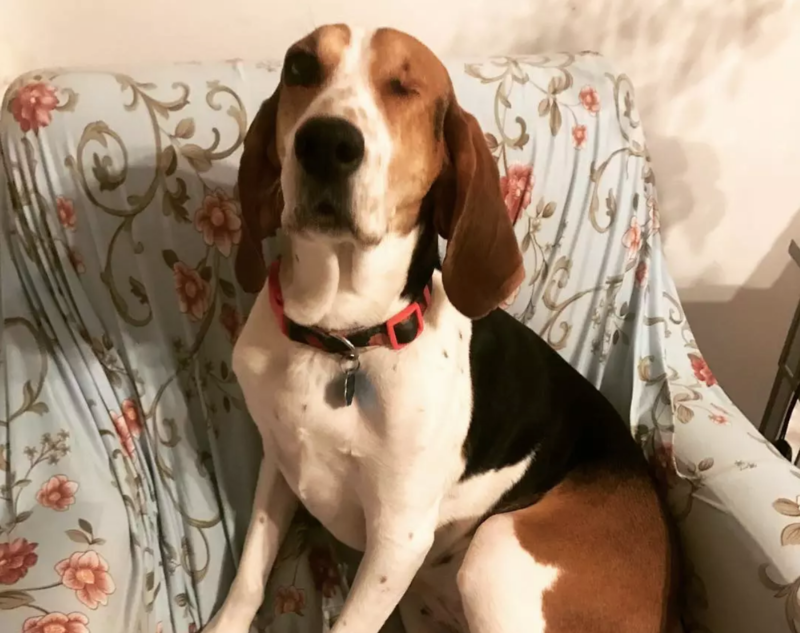 Lauren, who is devoted to saving abandoned hunting dogs as the founder of Magic’s Mission Beagle and Hound Rescue, Inc., brought Victoria home in October 2016 to join her and her husband, Ben Chatman, and their beagle named Lily. Her own healthy outcome after a brush with cancer is proof enough, says Lauren, that a hound’s keen sense of smell can come in handy long after hunting season.